Noonbarra Boris was a combination of two of our very best Kelpies of all time in Noonbarra Gabe and Tina. These were both exceptional dogs. Boris went on to be highly regarded in his district and John, his owner, would sing his praises to anyone who would listen. He was offered $3500 for him while he was still not much more than a pup. He could cast out the width of the property and once did a demonstration for a TV crew who were astounded by the ability of the dog. 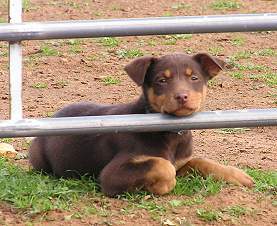 He was used on two occasions by the Merrigal Working Kelpie Stud and his pups sold out very quickly. 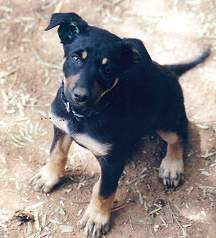 When he was an old dog, we tried to use Boris as sire over Noonbarra Kara but unfortunately it was not to be. We had a progesterone test on Kara so we knew she was right at the time. We even tried natural A.I at the Vets but that didn't work either. It was a disappointment to lose the genes of this great dog. 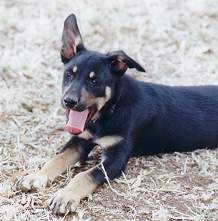 In 2001, out of the blue John asked to buy a new male pup. We had just the right pup at the right time and he picked up Noonbarra Mac II a full litter brother to Noonbarra Roy in the Stud. We thought Mac was a great pup. He would have been our choice even though by accident we ended up keeping his brother Roy III and Roy has been a big asset to our stud. John has phoned up a couple of times and said that Mac is the greatest dog he has ever owned and said that everyone who sees him thinks the same thing. He said he is even better than his old Noonbarra Boris and that is high praise indeed. I don't think we have ever had a customer more pleased with a dog. 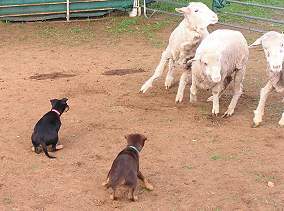 Noonbarra Del was bought especially for the sport of Arena (3 Sheep) Sheep Dog Trials. Tim already runs a Border Collie in this sport. Del was chosen by us as she demonstrated very good holding ability, quick cover and good eye on a few sheep. She had good distance but was brave enough to walk right in. It was a difficult choice as the litter had many pups in it that would have also suited what Tim needed but we thought Del had the break out and hold that is needed for 3 wild sheep on a trial ground. Hi there Steven and Mary, just a quick note to let you know Del has settled in nicely, everyone loves her, shes quite a character. Thanks again for everything I'll keep in touch, regards Tim. 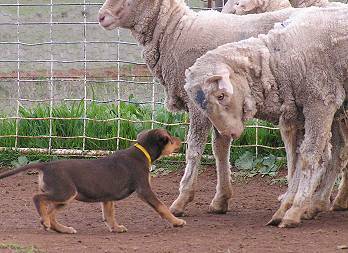 ..She's getting more confident every day, she's such a level headed dog..."
Noonbarra Del has the right cover, distance and holding ability to excel at Arena Sheepdog Trials and should be a wonderful dog for Tim. 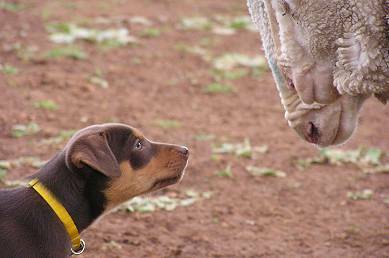 "..She's a great little dog and I love the style and sense she shows, strong and confident a couple more traits.no complaints whatsoever, pleased to have a great little kelpie to work with, she's already a great farm dog to have around works sheep ducks and cattle!" Noonbarra Mark is a pretty red & tan female despite the name. The owner named her after a friend. 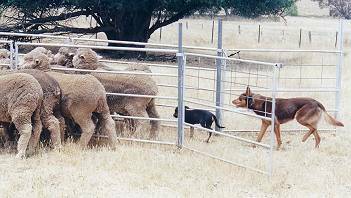 At 8 weeks of age she was phenomenal on sheep and when Rhys came to the Stud we put her on a few very wild sheep out in a small paddock for the first time. She really showed what good genes can produce. Lovely eye and style as well as holding ability and cover. She wasn't the only one that was exceptional in this litter. They were all extra good pups! There wasn't a lot of difference in work between Del, Mark, Matilda III and Brooke. Rhys left this message just a few days after taking her home. "In relation to little Mark, she is doing absolutely fantastic. We got one of those crates that you recommended which has been in our room every night and he sleeps all the night through and wakes up when he wants to go to the toilet about five, which is when I get up. And he goes outside." 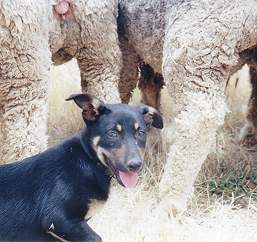 "Just for interest sake we put her on some sheep the other day just to see how she was going to look at them without another mature experienced dog and we actually had difficulty to get her off the sheep. 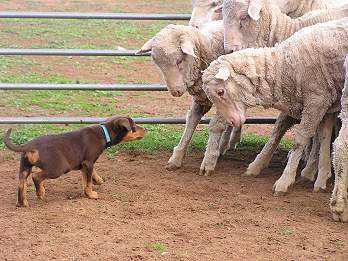 She continued to round these sheep up. 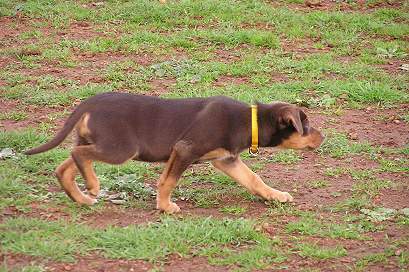 She didn�t know where to move them but she stayed her distance and continued to go around them. 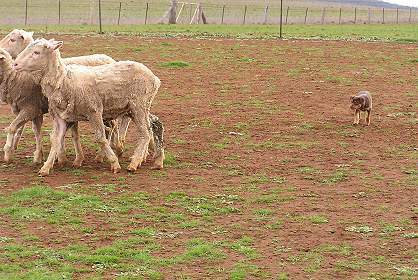 Fully working the sheep. We are really, really happy with her. She is doing excellent. "